I hope everyone had a happy (and safe) 4th of July. I had all kinds of great blogging plans for some spectacular Ice Cream Cone Cupcakes and other party recipes, but got derailed. Completely foiled. Those posts will be coming soon and they’ll still be perfect for all the summer parties yet to come. In the meantime, I’ve made these Blackberry Yogurt Swirl Popsicles several times and finally managed to get a few photos in before they all disappeared (again)! These are fantastic and a little more sophisticated than the popsicles the kids and I used to make in paper dixie cups way back when. But these swirled berry popsicles aren’t too sophisticated. They’re popsicles, after all. A very simple lemon (or lime) infused syrup perks up the berry flavors and gives the yogurt the perfect popsicle texture. It’s well worth the little extra time and effort. That syrup is a game-changer – if you’ve ever had a yogurt pop that was a little gooey or a little chalky you won’t have that issue. I’ve been slacking a little on making popsicles – I love that they’re fun and give a little portion control. And popsicles are so inexpensive to make at home. It’s been so hot this year I think I might declare this the year of the popsicle and make bunches and bunches of them! If you’re looking for kitchen gadgets, don’t be afraid to stop by your second-hand stores and donation centers…you never know what you’ll find. It make take some persistence and repeated visits if you’re looking for one particular item; I generally take the attitude that I’ll probably find something I want/need (even if I didn’t know it) and I usualy bring something to donate, which makes me feel better about buying more random kitchen stuff! Place lemon peel, water and sugar in a small saucepan. Cook, stirring, until it comes to a boil and sugar has dissolved. Gently simmer an addition five minutes. Strain, discarding peel and completely chill. This may be made ahead and refrigerated or cooled quickly by straining into a small bowl and then setting that bowl into a larger bowl filled with ice water. It should be cold to touch before using. If your berries are large, especially those huge blackberries I see in the market these days, cut them in half. Place berries in non-reactive bowl and squeeze 1 tablespoon lemon or lime juice over. Add honey, stir to combine. Set aside. Whisk yogurt and chilled syrup together and set aside. For the berry mixture, either mash by hand to desired texture or place in a blender and puree. If you wish to remove seeds, press through a strainer. 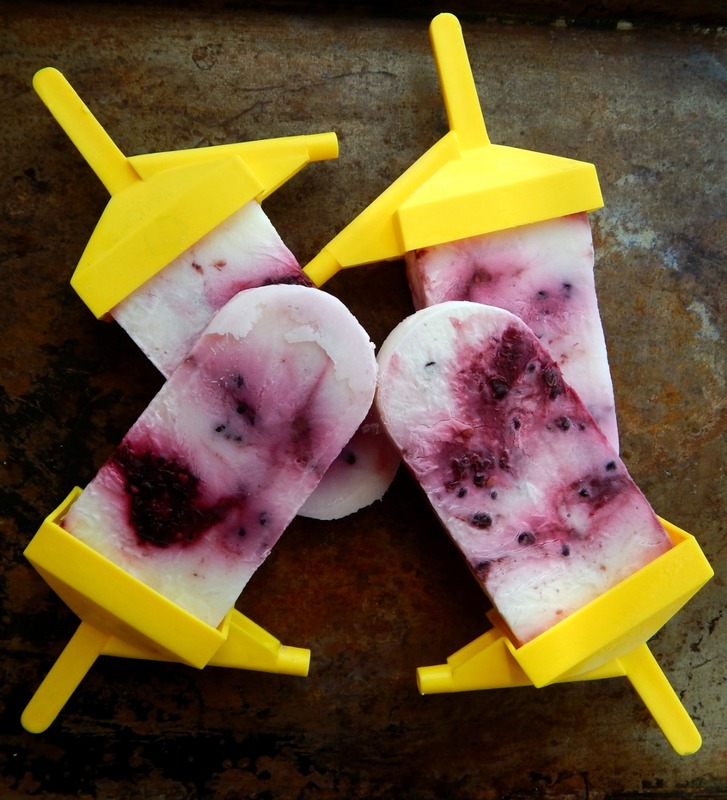 Assemble popsicles by spooning in (or pouring) a little of the yogurt mixture, then a little of the berry mixture into each popsicle mold, repeating until you reach 1/4-inch from the tops (to leave room for expansion as they freeze). Use a skewer to lightly swirl the mixtures together. Freeze until solid, 3 to 4 hours. If using glasses or other unconventional molds, freeze until the pops are beginning to set (45 minutes to 1 hour) then insert the sticks and freeze until solid, 3 to 4 hours. Makes 10 popsicles in 1/3 cup molds. Amount will vary depending on what molds are used. Note: If time allows, and especially if the popsicles won’t be eaten all at once, right away, I like prefreeze a plate or tray before unmolding the popsicles. Then I place the mold in hot water for 10 second increments and as soon as they pop out, lay them out on the frozen plate and put back in the freezer. That keeps them from melting prematurely from the heat of the unmolding. Adapted from Fany Gerson’s Paletas, by way of Smitten Kitchen. I’ll be posting this recipe on Fiesta Friday number 179, hosted by Angie and co-hosted by Petra @ Food Eat Love and Laura @ Feast Wisely.Be sure to stop by Fiesta Friday and Petra and Laura’s blogs and see what everyone is making this week. This entry was posted in Click here for Fabulous Food Posts and tagged Berries, Blackberries, Desserts, Fany Gerson’s Paletas, frozen desserts, Frugal Hausfrau, Popsicle, smitten kitchen, Yogurt. Bookmark the permalink. What a perfect treat on a hot summers day! Yum 🙂 Happy FF! I’ve got some raspberries and greek yogurt on hand, I wish I had popsicle molds! These sound so refreshing! Ha! They taste the same no matter the mold! They do look and sound delicious. Our blackberries are winding down, but I could probably gather up enough for some of these! Mollie, I have 9-year-old twin nieces. They would love these. Alas, we are mid winter here in New Zealand so no fresh blackberries on offer. I shall have to stash this recipe away until the seasons change. Thanks, Tracey, but you could try it with frozen berries, since they’re frozen anyway – if you like to eat frozen stuff in the winter! Thanks, Mollie. I do often defrost frozen blueberries for my muesli in the morning. So could definitely try this. I want this popsicle asap, looks incredible! Thanks much!! Sorry for the late reply!! I’m losing it between doc appts for the folks and yard work…. No biggie. That’s more important. Happy cooking. Me, too, Suzanne. I know everyone is allabout eating locally and I don’t know where these blackberries came from (no where near here, I’m guessing) but they were soooo good! I was putting a few in the bowl, eating a few, lol.